UPDATE: Thanks to Gráinne and Eggs from the EU Battle.net forums, an undocumented PVP change was brought to our attention — Players that have earned a Prestige companion on one faction can now purchase the companion of the same rank on the opposing faction. There are 42 new pets added in Patch 7.3. 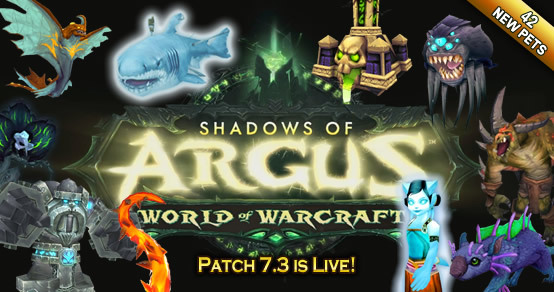 From Argus wild pets and drops, to the next installment of Raiding With Leashes, there's a variety of pets to collect! Raiding With Leashes V - 15 new pets found in Cataclysm raids — collect them all and earn the achievement Raiding With Leashes V: Cuteaclysm which rewards Amalgam of Destruction. 12 new wild pets found on Argus, a few of which come in different colors! 6 non-wild pets from Argus. 2 new profession dropped pets - Herbalists and Skinners will find one each on Argus. 2 reputation pets - One from a new Master Fisher NPC in Azsuna, but only once you've earned enough reputation with her. Only one Master Fisher will appear on the Broken Isles each day. The second pet can be purchased after you've earned enough esteem with the Argussian Reach on Argus. 2 new holiday pets - Hallow's End and Feast of Winter Veil. 1 new dropped pet from a new Trainer (more information below). And last but not least, an achievement pet for completing a new set of Pet Battle challenges on Argus (more information below)! With all of these new pets, it might be difficult to choose which one will accompany you on your adventures. Let RNG choose for you and use the new Summon Random Battle Pet (pictured below) button to call out a random favorite pet. Head to Gnomeregan to find a new trainer, Environeer Bert. This NPC is similar to Crysa, however instead of three flying pets, Bert has three epic quality level 25 Mechanical pets. Complete his daily quest to receive a Leprous Sack of Pet Supplies, which has a chance to drop the new pet, Dibbler! Speaking of Crysa, both she and Bert have received a unique update in 7.3 — scaling pets! Some new tech is being tested on these two Trainers that allows for their teams to match the highest level pet on a player's team. Only the level will scale, and Trainer pet qualities and breeds will not change. We'll have to see if other Trainers will eventually receive the same scaling tech in the future. In the same style as the Family Familiar achievement, Argus will have its own set of Pet Battle challenges. Family Fighter is a new meta-achievement that rewards the Felclaw Marsuul pet (pictured right). Players must use each pet type to defeat a total of 18 new pet NPCs found on Argus. These fel-corrupted pets have new abilities that will require your best team to overcome! Unlike Family Familiar, Family Fighter will not be gated behind specific World Quests popping up each day. Instead, the NPCs of Family Fighter will always be spawned and available to battle, allowing battlers to complete these new challenges as quickly or as slowly as they please! A few pets received updates in this latest content patch. With the influx of so many new pets, we've updated Dragonkin, Flying, Critter, Humanoid and Aquatic pet families with one new sub-category each. Check out all pet families (and their sub-categories) here: Companions By Family. It says it even if I have none. Today it told me I already had 3 WHEN in actuality it would have been unique, & rare to boot, sigh. Something similar happened a couple of years ago; the work around was cage everything possible to bring inventory under 700. I have 1023 pets (711 unique) so I wondered if this was the issue, but I find no such mention. I am sad that there is no Murky this year from Blizzcon. I do love the new mounts, but Allways did like getting a new pet from Blizzcon... Sniff.. Sadness!! When you update your collection you have to exit wow. If you do not it will not pick up your new pets. I think is because the Armory only upfates when you exit wow. So do that and see if it picks up your changes. Angelcat "Is it just me or are the newer pets bugged for anyone else, already gone and caught 6 wild pets but not updating on here." I caught 3 new pets on Argus yesterday..today I got the monk pet leveled too 25 by stone..went and updated my pet collection and it only updated by 2...not 4. I like the new subcategories, theres simply so many pets in WoW that I think it was much needed. It probably wouldn't do me any good with moveset vs breed, for that I'm using wowhead's pet ability filters. However there are many ways to enjoy pets in WoW and I'm sure this helps people finding their favorite looks/type. Any of these pets stand out as exeptionally good / must haves? @Angelcat2887: Importing/updating a WarcraftPets collection is working, however it seems slower this patch. It might take multiple attempts to properly update your WarcraftPets stats. Before re-importing, make sure to log out of your character (sometimes logging out of the game completely works best) so that your armory profile is updated. Is it just me or are the newer pets bugged for anyone else, already gone and caught 6 wild pets but not updating on here.